Brewer & Associates, a full service insurance provider serving the families of greater Huntsville, AL, launches a new fundraiser in their ongoing community involvement program. The latest campaign reaches out to support the needs of homeless veterans in collaboration with Operation Stand Down. Brewer & Associates, a full service insurance firm serving families of the Huntsville, AL metro area, has announced the latest beneficiary of their ongoing community enrichment program. 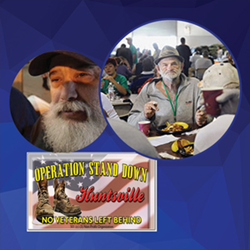 The current campaign fundraises for Operation Stand Down Huntsville, an organization which reaches out to the area’s homeless veterans. Readers wishing to provide a safe, informative, welcoming environment for these American heroes, where they can find help and hope, may visit: http://www.osdh.org/donations.html. Brewer & Associates has just recently launched their master charity program, pledging to select a worthy local organization, family or individual every two months to receive their support. The agency’s caring team is mobilizing support for Operation Stand Down through their social media, email and text message communications. They have also dedicated a full page of their monthly publication, which is delivered to thousands of households in Huntsville and surrounding communities, to feature the campaign. The electronic Flipbook version of the Our Hometown is available here: http://www.brewerandassociates.com/Our-Hometown-Magazine_46. Readers who wish to join Brewer & Associates in taking a stand for homeless veterans through the efforts of Operation Stand Down are invited to visit the campaign’s webpage, and are encouraged to help spread the word by forwarding it to others. The agency itself has promised to donate $10 to Operation Stand Down for each and every referral they receive for an insurance quote, with no purchase necessary. Referrals and donations may both be made here: http://www.brewerandassociates.com/Taking-A-Stand-For-Homeless-Veterans_17_community_cause. To learn about past campaigns supported by Brewer & Associates, please visit: http://www.brewerandassociates.com/community-cause. More information on the agency and Operation Stand Down is available here: http://www.brewerandassociates.com/ and http://www.osdh.org/. Serving families from two locations in Huntsville, AL, award-winning Brewer & Associates is a family owned and operated, full service insurance agency which is committed to bringing local people an agency which understands their needs. Ross Brewer and his team of dedicated professionals work with carriers to assemble a variety of products and services which will ensure clients’ peace of mind. From all of the products a typical consumer needs (home, auto, boat, ATV, etc. ), to financial planning and retirement, their goal is to deliver consistently superior service. The caring agents at Brewer & Associates may be reached by calling 256-533-1200.